Poor visibility, but I've seen worse. On Sunday morning I woke up to fog so thick I could hardly see the port entrance. Large water drops fell from the soggy sail flaked on the boom ready to be hoisted. The lockers were stocked with sufficient food, the water tank half-filled, and I had enough diesel for 60 hours of motoring. Out of frustration I washed the deck and cleaned the inside some, but not that much....a boat is a boat and shouldn't look like a clinic. While sipping my mid-morning instant coffee I spotted a red sailboat, a Challenger called Jane, docking at the transient pontoon across from me. What!! I ran over and asked them if it was less foggy out on the water. "No, we got caught in it while sailing from Porto," said a recently-retired-looking English woman. To which her husband added, "At one point I couldn't see the genoa. Our radar is ancient but it still works." They looked vaguely familiar, and Google proved me right. It was less foggy the next morning. At 7 a.m. I pulled in the bow and stern lines and started doing the pivot-propwash manoeuvre. On passing by the Challenger's stern Jane's head popped out of the companionway. "We're leaving as soon as we finish breakfast. See you Cascais." 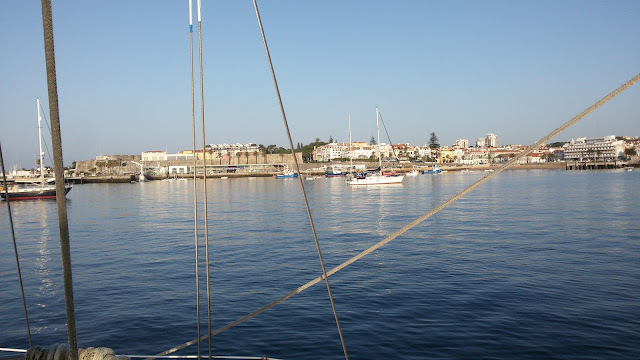 The Cascais anchorage fairly empty in July. 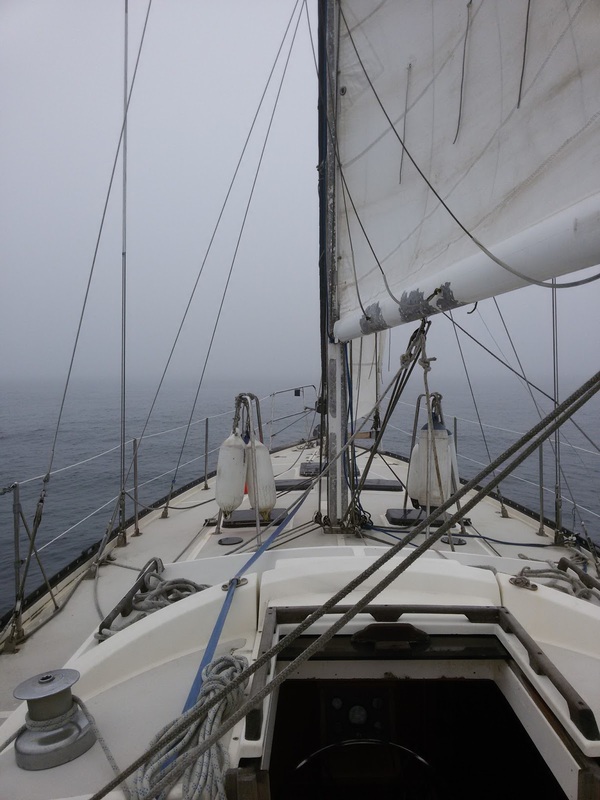 I motorsailed most of the way, even after the fog lifted. And for the first time in 14 years, instead of wind blasting down Sintra Mountain and across Cabo Raso, I motored around the cape with limp sails. After anchoring, I celebrated with a glass of red wine and spent the evening lying in the cockpit happy to be alone. Cascais is a beautiful town, and even more so when seen from the peaceful bay. Your intro sounded like it came out of a Blues Brothers flick! Great couple, eh. Too bad they didn't showup... would have been great to hangout in an anchorage with them. Motorsailed the whole way..... yup, I inow that feeling! Yeah, I've seen worse fog, the type that you don't see what you hit until its too late (not that I ever hit anything except pontoons while docking). On this day, I'd have the luxury of seeing what I was hitting and enough time to say Sh*****! The good thing about foggy days is nobody is out there.